This is an Trend Momentum Trading system. 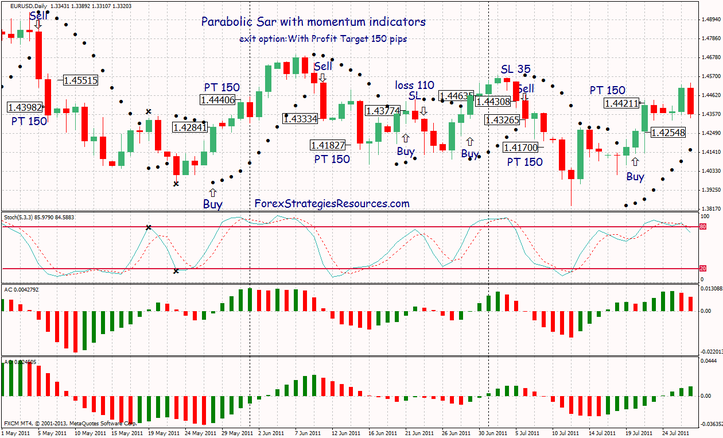 Parabolic Sar and Awesome are a Trend indicators. Accelerator oscillator and Stochastic indicator are momentum indicators. When you see the Parabolic Sar Indicator dot above the candle, and the Awsome oscillator (AO )is red, and the Accelerator oscillator (AC) is red, and Stochastic are crossing down but do not enter if the stochastic lines are already in oversold territory , then enter short. Only enter at the close of the candle. When you see the Parabolic SAR Indicator dot below the candle, and the AO is green, and the AC is green, and Stochastic indicator are crossing up do not enter if the stochastic indicator lines are already in the overbought territory , then enter long. Only enter at the close of the candle. With Profit Target Predetermined 150-170 pips depends by Currency Pairs. Place Stop Loss is at the previous high/low of the candle (i.e. day’s high if going short, and day’s low if going long) . Below examples of the exit positions options. 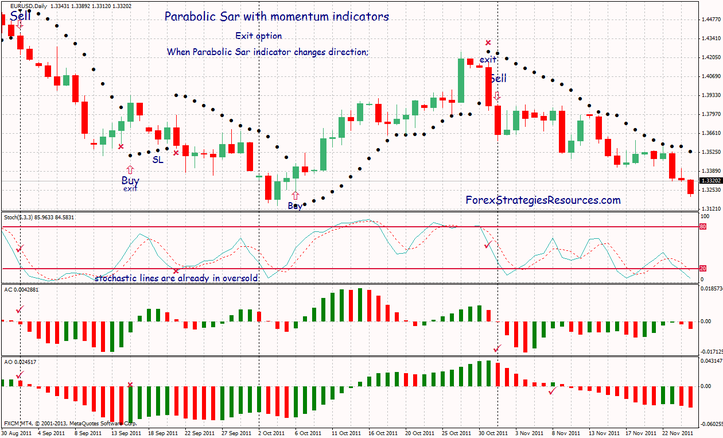 In the pictures Parabolic Sar forex system in action.